← You So have to watch this!! I give up on everything…dont feel like doing anything anymore. Don’t want to speak to anyone or listen to anyone. 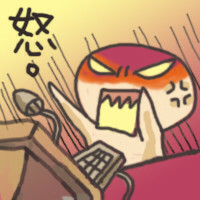 whole class work kena reject by our lecturer…need to redo..spend whole day brainstorming because need to resubmit tomoro. Before that, i kena accussed by my lecturer of something i did not do. Those that attend classes 14/14 times doesn’t mean they can pass your exam, u know or not sir ? Ohh…i feel so sorry for all my coursemates…you can see them all go haywire because of this final year project. Can say each of their msn will read “freaking tired cuz of freaking tough asgmnt!! arghhhhhh!! !” or something similar…u get the idea lar….Warao! All pandas united!! HOOOO!!!!!! i think i sick liauuuuuu…………sick of everything…YEs, emo again. Want to sleep but canot sleep because too many things to do. Tomorrow under the order of DivaLisa, i need to go to the shithole, fondly called Pudu by others to get tickets for my cousins and myself. Oi, i already want to go back penang on thursday, 1 or 2 more days canot wait ar!! I hope i don’t fall sick again this year. Last year suplex canot go because i’m sick.